Has received several new contracts with a total value of more than $120 million. SAN JOSE, Calif., (Apr. 29, 2009) - Vision Systems International, LLC (VSI), a leader in advanced Helmet Mounted Display (HMD) technology, has received several new contracts with a total value of more than $120 million. The Boeing Company awarded VSI a contract for the delivery of more than 550 additional Joint Helmet Mounted Cueing Systems (JHMCS). VSI also received direct contracts from the U.S. Navy and U.S. Air Force for spares and Ground Support Equipment (GSE) in support of the JHMCS program. Under the production contract, VSI will provide JHMCS hardware, including spares, technical support and GSE for the Full Rate Production - Lot 5 (FRP-5) acquisition. This procurement fills U.S. government domestic requirements for the U.S. Air Force F-15E and F-16, Air National Guard F-15, U.S. Navy F/A-18C/D/E/F/G single seat and dual seat platforms, as well as foreign military sales production and spares commitments including: Australia (F/A-18), Belgium (F-16), Turkey (F-16), and other countries. Deliveries under FRP-5 will commence this year and continue through 2010. “With the delivery of more than 3,000 systems, the JHMCS is the world’s premier helmet display for fixed-wing tactical aircraft,” says VSI President Drew Brugal. “The system provides the warfighter with unmatched situation awareness throughout the operational profile of the jet. Brugal added that the award will have a substantial economic impact with the creation of high quality jobs in the San Jose area. The JHMCS provides the pilot with “first look, first shot” high off-boresight weapons engagement capabilities. The system enables the pilot to accurately cue onboard weapons and sensors against enemy aircraft and ground targets without the need to aggressively turn the aircraft or place the target in the Head-Up Display (HUD) field-of-view for designation. Critical information and symbology, such as targeting cues and aircraft performance parameters, are graphically displayed directly on the pilot’s visor. Formed in 1996, VSI, is a joint venture between Elbit Systems of America, a subsidiary of Elbit Systems Ltd. (Nasdaq: ESLT), and Rockwell Collins Inc. (NYSE: COL). VSI was formed to develop, manufacture and support fixed wing Helmet Mounted Displays (HMDs) worldwide. VSI today is a leading supplier of fixed-wing HMDs worldwide. 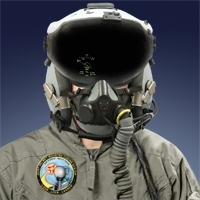 In addition to the JHMCS production, VSI is developing the advanced HMD for the F-35 (JSF); a Night Vision Cueing & Display (NVCD) QuadEye™ system for the U.S. Navy and U.S. Air Force; Helmet Mounted Avionics (HMA) solution for Trainers, Light Attack and Military Airlift; and is also producing the Display and Sight Helmet (DASH) Generation IV HMD under multiple contracts.